It might buy a stake in $33 bln U.S. insurer Aflac, which does business mostly in Japan. Financial conglomerates that mix banking and insurance have a patchy record; so does Japan Post when it comes to overseas acquisitions. At least this would be a watered-down version of both. 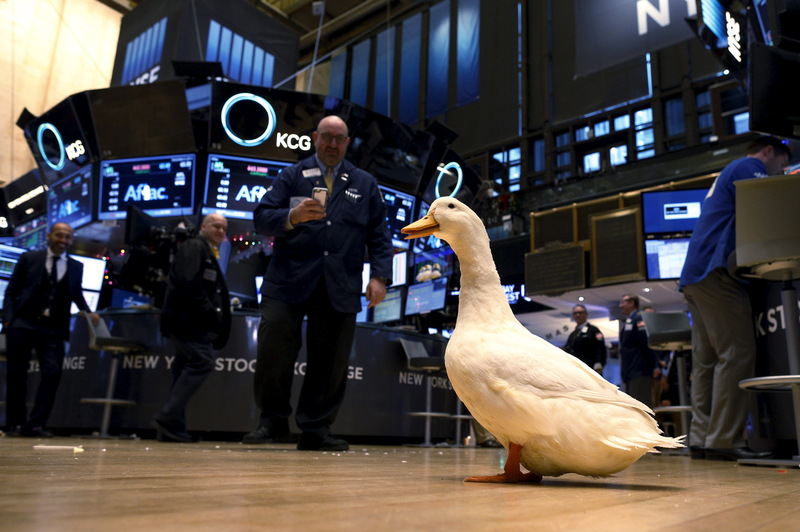 Traders watch as the Aflac duck walks on the floor of the New York Stock Exchange December 4, 2015. Japan Post plans to invest about $2.6 billion in Aflac, with an aim to become the largest shareholder in the U.S. insurer, according to a source cited by Reuters. The potential investment was first reported by Nikkei. The postal delivery, bank and insurer plans to acquire a 7 percent to 8 percent stake. Japan Post would be able to increase its stake to a maximum of 20 percent in four years. Aflac said in a statement it was engaged in talks with Japan Post discussing a minority investment, but the talks did not involve Aflac or its subsidiaries becoming a member of the Japan Post group. Aflac has sold cancer insurance at Japan Post offices since 2013.